It's hard to admit when I've been had, so know that it is with great difficulty when I say that I've been fooled by fake MAC. 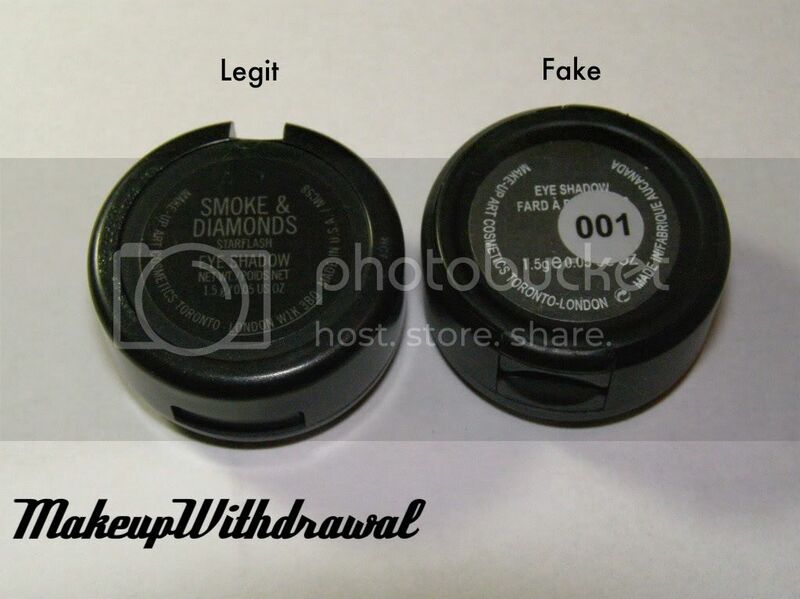 It was a long time ago, I ordered fake shadows from eBay and now I want you to know exactly what to look out for because I know it is tempting to want to get a good deal on makeup. I'm sharing with you observations I've made, to the best of my knowledge. First off, I want to point out that there are only a FEW places to get legitimate MAC cosmetics. Your local MAC store (and MAC Pro store), any MAC counter at department stores like Nordstrom, MAC's online website (and previously, MAC Pro website) and Estee Lauder Company (who owns MAC) outlet stores which are sometimes called The Cosmetics Company Outlet or The Cosmetic Company Store (CCO for short). 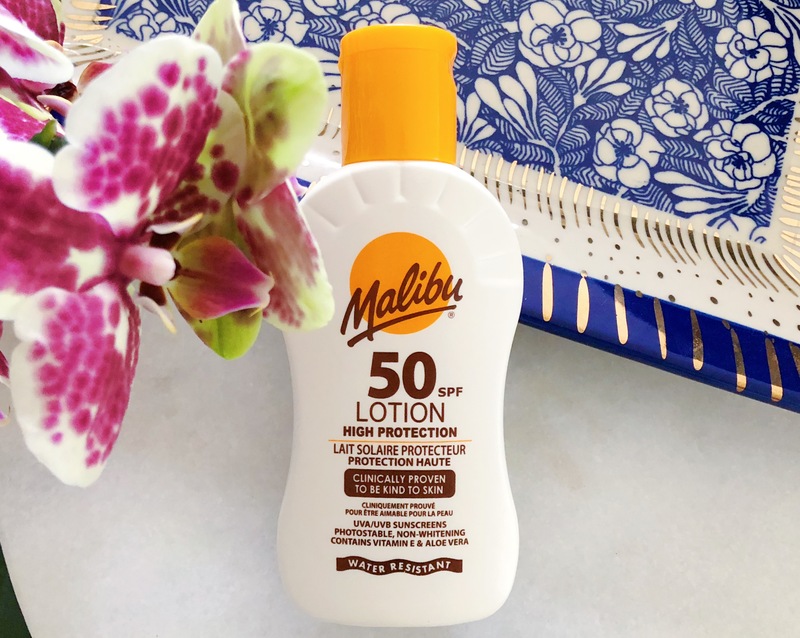 There are a handful of online sites that sell MAC but they are quite hard to find- on eBay there will sometimes be some authentic products, but it is also flooded with outright counterfeits. 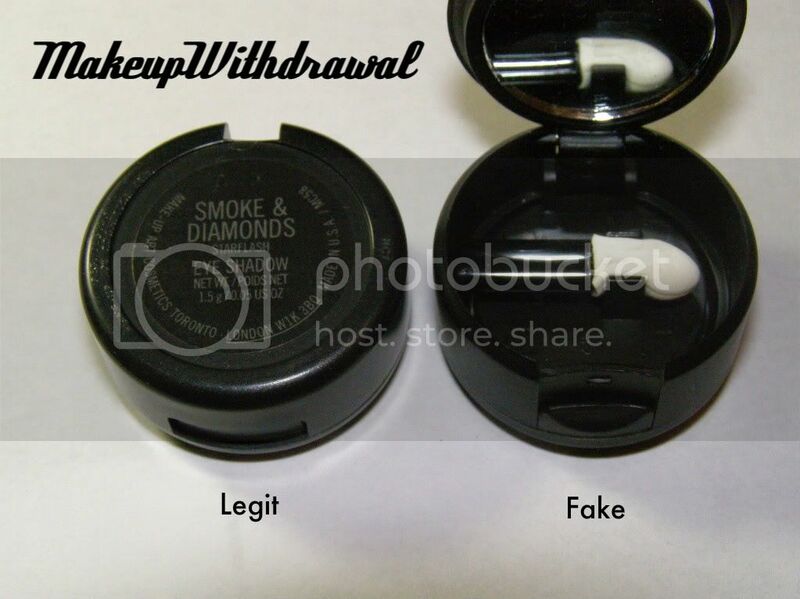 Places that claim to sell MAC at wholesale prices ARE selling counterfeit products. Another place that you'll frequently find fake MAC are swap meets or flea markets. Notice how the fake MAC doesn't have a layer upon which the pan rests? With legit MAC shadows, this is how depotting is possible. The bottom of the fake MAC has a second flip chamber, containing a sponge. 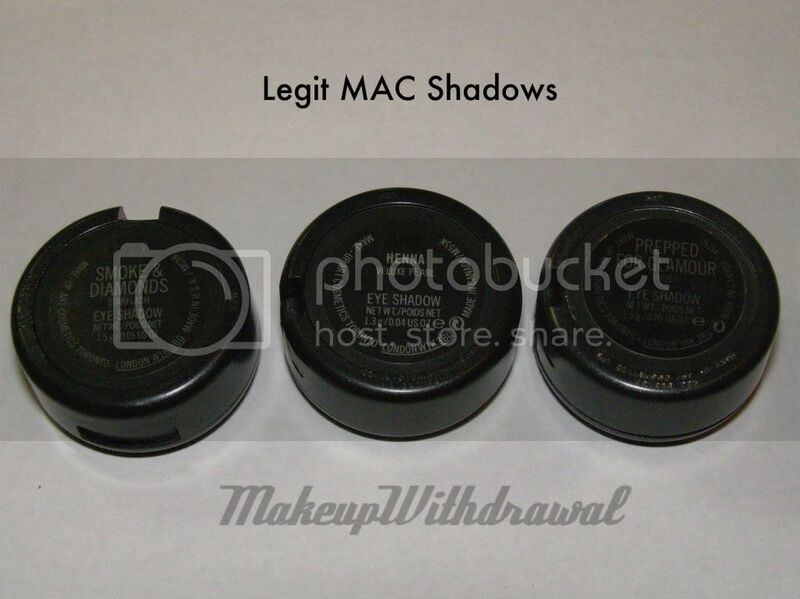 No legit MAC shadow has a sponge applicator inside. 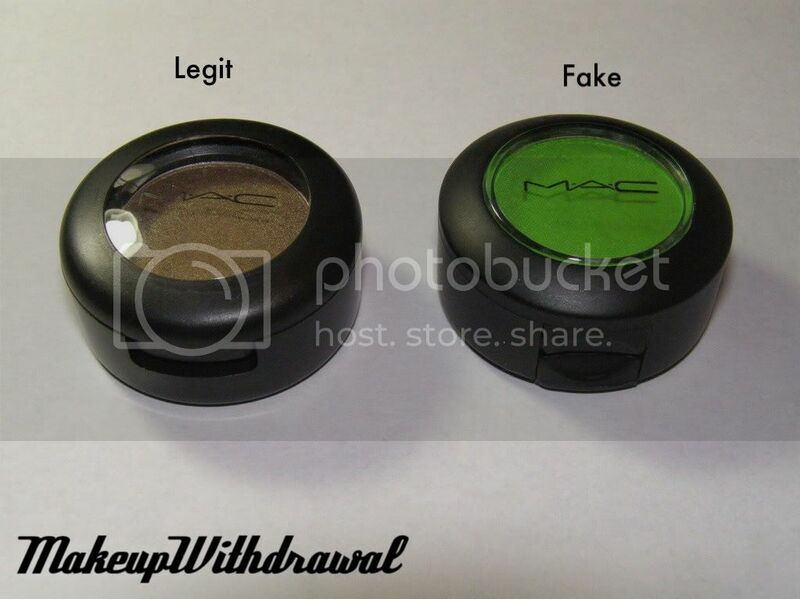 Here are some comparison pictures of fake MAC compared to legit MAC eyeshadow. Be advised that NOT all fake MAC looks the same, there seems to be different manufacturers and some of them make really good fakes. When in doubt, bring it in to a MAC counter (heck, I'd say when it doubt, just don't buy it). Now, over the years MAC has changed their labels a bit- mostly font size and adding a small Back 2 MAC logo. Sometimes the rotation of the label has change too (the newer ones I have seem to be a quarter turned to the right). Sorry I don't have the boxes any more to show you! But I do remember that the fake MAC (that green shadow shown above) came in a box with a sticker labeled "Juxt 1" and no batch number (which starts with A and ends in a 2 digit number). 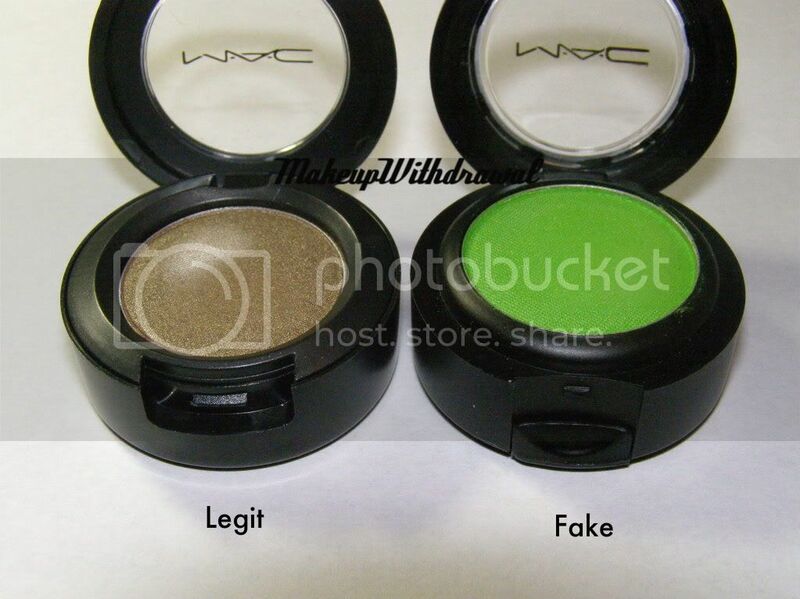 Now, fake MAC eyeshadow can be hard to distinguish for the average person- sometimes the quality is really great. Indeed, the shadow I showed you above has fantastic pigmentation for a matte shadow. But with fake products, the consumer has NO idea what truly went into the product, no quality control with the manufacturing and no company liable should the product cause some sort of horrific reaction on your face. Therefor, I beg of you- if you or anyone you know is using questionable MAC- bring it in to your closest counter and have it checked out. Another great resource is Specktra.net - the very knowledgeable ladies and gents over there even have a thread discussing fake MAC. Hope you have a wonderful evening and weekend!